In a city with a nasty cyborg problem, your blade is the only thing that stands between order and chaos. Sink so deep into the shadows that you become one in shooting and fighting and other stickman games. Or go for a laugh with our lighter stickman fare. Stickman fighting games will have you facing your shadow doppelgangers in the arena or on the streets, which are also the setting for the badass stickman shooting games, like the Sift Head games that cast you as an assassin with a lethal flair – whether that's with a gun, a sword, or just your bare-knuckle fists. Step into the stick figure of a gangster, a ninja, a sharpshooting hitman. Or join an army of stickmen in defending your base, or engaging in full-blown war, modern or ancient, on the land or in the air. 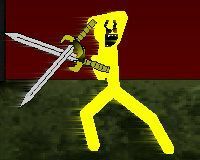 It's not all about killing stickmen, though – the stickmen also have a lighter side. Which you can explore in sports and stunt games like Stickman Soccer 2 or Stickman Freestyle BMX. Fans of adventure can find their fill of fun in the role-playing game Stick RPG 2, where you get to explore another dimension (the tricky part is just finding your way back home). Sometimes, though, you just want to cause a little trouble for fun – did anyone say sabotage? If you're raising your hand, you'll dig the dark humor in games like Stickman Jam: Sticktanic and Casualty Stick Isolation. Whether you like stickman killing games, sports games, or just giving a stickman a rough day for a few laughs, when you're looking to blend into the shadows with edgy graphic animations and a touch of wry humor, these stickman games will deliver.